Limited Time Offer: Discounted Membership & Greg’s Ride Registration! 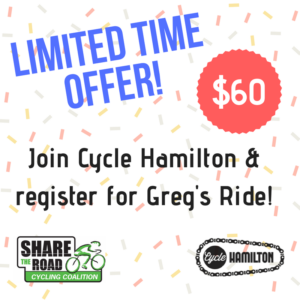 Cycle Hamilton and Share the Road have partnered to launch a limited time membership deal where you can support the work of two great organizations at once and enjoy a great ride! Between now and September 14th, you can join (or renew) at a special membership rate of $60. 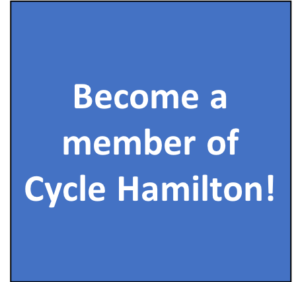 This includes a 1-year membership with Cycle Hamilton and a ticket to Greg’s Ride on September 23 in Dundas. This is a $100+ value. Greg’s Ride is Ontario’s Ride for Safe Cycling and all funds raised go towards supporting Share the Road, our voice for cycling at Queen’s Park. Over the past 10 years, Share the Road has successfully advocated for changes like the 1m safe passing law, #CycleON: Ontario’s Cycling Strategy and for over $125 million in funding for cycling infrastructure. Here in Hamilton we have received over $3.7 million of this provincial funding to build crucial connections like the Claremont Access. Your ticket to Greg’s Ride includes a choice of 3 distances (8km, 37km or 77km), a hot lunch, drinks from Shawn & Ed Brewery and ride support. ← Needed: Ward Ride Leaders!